With an enzyme defect, carbohydrate metabolic pathways are blocked and excess glycogen accumulates in affected tissues. Each GSD represents a specific enzyme defect, and each enzyme is in specific, or most, body tissues. Liver phosphorylase, which is found in the liver and red blood cells, is deficient, which results in glycogen accumulation in the liver and subsequent hypoglycemia. These inherited enzyme defects usually present in childhood, although some, such as McArdle disease and Pompe disease (also known as acid maltase deficiency), have separate adult-onset forms. In general, GSDs are inherited as autosomal recessive conditions. Several different mutations have been reported for each disorder. Diagnosis depends on findings from patient history and physical examination, muscle biopsy, electromyography, ischemic forearm testing, and creatine kinase testing. Biochemical assay for enzyme activity is the method of definitive diagnosis. Individuals with GSD VI can present with hepatomegaly with elevated serum transaminases, ketotic hypoglycemia, hyperlipidemia, and poor growth. Symptoms result from mild hypoglycemia. Liver fibrosis and hepatocellular carcinoma have been reported in patients with GSD VI. Obtain a creatine kinase level in all cases of suspected glycogen storage disease (GSD). Because hypoglycemia may be found in some types of GSD, fasting glucose testing is indicated. In Hers disease, hypoglycemia is a primary concern. Urine studies are indicated because myoglobinuria may occur in some patients with GSDs. Hepatic failure occurs in some patients with GSDs, although rarely in those with Hers disease. Liver function studies are indicated and may reveal evidence of hepatic injury. Biochemical assay of enzyme activity is necessary for definitive diagnosis. Findings from imaging studies may reveal hepatomegaly. 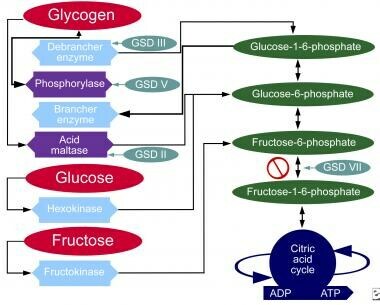 The chart below demonstrates where various forms of GSD affect metabolic carbohydrate pathways. Although at least 14 unique GSDs are discussed in the literature, the 4 that cause clinically significant muscle weakness are Pompe disease (GSD type II, acid maltase deficiency)  , Cori disease (GSD type III, debranching enzyme deficiency), McArdle disease (GSD type V, myophosphorylase deficiency), and Tarui disease (GSD type VII, phosphofructokinase deficiency). One form, von Gierke disease (GSD type Ia, glucose-6-phosphatase deficiency), causes clinically significant end-organ disease with significant morbidity. The remaining GSDs are not necessarily benign but are less clinically significant; therefore, the physician should consider the aforementioned GSDs when initially entertaining the diagnosis of a GSD. Interestingly, GSD type 0 also is described, which is due to defective glycogen synthase. Herling and colleagues studied the incidence and frequency of inherited metabolic conditions in British Columbia. GSDs were found in 2.3 children per 100,000 births per year. Morbidity results from consequences of hepatomegaly. In general, GSDs present in childhood. Later onset correlates with a less severe form. Consider Pompe disease if onset is in infancy. William Stone. Glycogen Storage Disease. Abdullah Adil. StatPearls. October 14, 2017. Treasure Island (FL): StatPearls Publishing LLC; 2018 Jan. [Full Text]. Brown LM, Corrado MM, van der Ende RM, Derks TG, Chen MA, Siegel S, et al. Evaluation of glycogen storage disease as a cause of ketotic hypoglycemia in children. J Inherit Metab Dis. 2014 Jul 29. [Medline]. Parker EI, Xing M, Moreno-De-Luca A, Harmouche E, Terk MR. Radiological and clinical characterization of the lysosomal storage disorders: non-lipid disorders. Br J Radiol. 2014 Jan. 87(1033):20130467. [Medline]. [Full Text]. Tang NL, Hui J, Young E, et al. A novel mutation (G233D) in the glycogen phosphorylase gene in a patient with hepatic glycogen storage disease and residual enzyme activity. Mol Genet Metab. 2003 Jun. 79(2):142-5. [Medline]. Chang S, Rosenberg MJ, Morton H, Francomano CA, Biesecker LG. Identification of a mutation in liver glycogen phosphorylase in glycogen storage disease type VI. Hum Mol Genet. 1998 May. 7 (5):865-70. [Medline]. Davit-Spraul A, Piraud M, Dobbelaere D, Valayannopoulos V, Labrune P, Habes D, et al. Liver glycogen storage diseases due to phosphorylase system deficiencies: diagnosis thanks to non invasive blood enzymatic and molecular studies. Mol Genet Metab. 2011 Sep-Oct. 104 (1-2):137-43. [Medline]. Beauchamp NJ, Taybert J, Champion MP, Layet V, Heinz-Erian P, Dalton A, et al. High frequency of missense mutations in glycogen storage disease type VI. J Inherit Metab Dis. 2007 Oct. 30 (5):722-34. [Medline]. Roscher A, Patel J, Hewson S, Nagy L, Feigenbaum A, Kronick J, et al. The natural history of glycogen storage disease types VI and IX: Long-term outcome from the largest metabolic center in Canada. Mol Genet Metab. 2014 Nov. 113 (3):171-6. [Medline]. Bali DS, Chen YT, Austin S, Goldstein JL. Glycogen Storage Disease Type I. Adam MP, Ardinger HH, Pagon RA, et al. GeneReviews. August 25, 2016. University of Washington, Seattle: 1993. [Full Text]. Jose Morales. Glycogen Storage Disease, Type II (Pompe Disease). Steve Bhimji. StatPearls. November 25, 2017. Treasure Island (FL): StatPearls Publishing LLC; 2018 Jan. [Full Text]. Manzia TM, Angelico R, Toti L, Cillis A, Ciano P, Orlando G, et al. Glycogen storage disease type Ia and VI associated with hepatocellular carcinoma: two case reports. Transplant Proc. 2011 May. 43(4):1181-3. [Medline]. Asami T, Kikuchi T, Asami K. Effect of clonidine on the height of a child with glycogen storage disease type VI: a 13 year follow-up study. Acta Paediatr Jpn. 1996 Oct. 38(5):524-8. [Medline]. Ji HF, Wang WL, Shen Y, et al. Reduced-size liver transplantation for glycogen storage disease. Hepatobiliary Pancreat Dis Int. 2009 Feb. 8(1):106-8. [Medline]. Aminoff MJ, ed. Electromyography in Clinical Practice. 3rd ed. New York, NY: Churchill Livingstone; 1998. Burwinkel B, Bakker HD, Herschkovitz E. Mutations in the liver glycogen phosphorylase gene (PYGL) underlying glycogenosis type VI. Am J Hum Genet. 1998 Apr. 62(4):785-91. [Medline]. Chen Y. Glycogen Storage Diseases. Scriver CR, Beaudet AL, Sly WS, Valle D, Childs B, Vogelstein B, eds. The Metabolic and Molecular Bases of Inherited Disease. 8th ed. New York, NY: McGraw-Hill; 2000. Vol 1: 1537-8. DiMauro S, Bruno C. Glycogen storage diseases of muscle. Curr Opin Neurol. 1998 Oct. 11(5):477-84. [Medline].